It’s no secret that Weddings can be very expensive and budgeting them can be complicated. One aspect that I find brides forget to budget or don’t know how to budget are Wedding Flowers. Sometimes the pricing can be quite a shock. If you’re wondering why flowers can sometimes have a heavy price tag, here is a little insight as to why Wedding Flowers cost so much. Planning out Wedding flowers and physically taking care of them, takes many long hours and lots of work. From working with Brides on their initial quote to every phone call and email up until the time of the wedding, we estimate that we spend a total of 20 – 40 hours of work on each Wedding. Floral designers will spend many hours just listening to you, responding to your emails, texts, and phone calls, taking in your ideas, doing research, synthesizing, and communicating back to you their understanding of everything you want. That’s even before the product sourcing, flower conditioning, designing, delivering and setting up, and in some cases, returning to break-down and pick up rental items. Times that by a hundred weddings a year and you can imagine all the time and effort put into these events. Within the month of the Wedding, florists are busy getting final counts in and fine-tuning all orders and recipes. We also do lots of research to make sure we are getting the perfect varieties and colors that will fit your vision. We also need to make sure we are ordering enough of each variety of flowers for every arrangement you order. Who thought being a florist would require so many math skills! Along with flowers, we order and count vases, ribbon, wristlets, liners for containers, and every little supply that we may need. Most flowers depending on the season are going to be shipped in from outside of the USA. Most flowers are going to come from Holland and South America. So there is a lot of production before they even reach the U.S let alone our store. Once the flowers arrive, we make sure all buckets and rentals are properly cleaned and disinfected, and then filled with water and disinfected. Then every stem or bunch that arrives needs to be unpacked, chopped and watered. Depending on the types of blooms, some require refrigeration right away and others can wait a day or two before placing in coolers. Depending on the size of the wedding that came be up to 30, 15-25 lb. buckets that need to be moved and stored. From there it is a team effort to make sure everything is created on time and in perfect form for the Wedding. With these large events it is often a team effort, rarely does one person do all the work by themselves. There is a lot of hard work and labor that goes into all of the production. When coming to any professional florist, you’re getting a work of art. 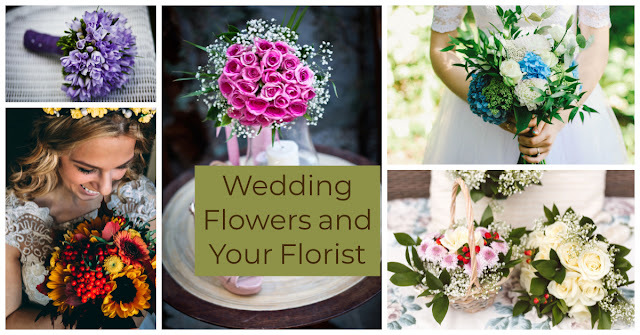 From hand tied bouquets, boutonnieres to centerpieces you’re paying for a professional to design and create something truly spectacular for you. There is lots of care and precision that goes into every arrangement! If choosing to have full set-up, we also make sure every piece is placed in the correct spots and is just as outlined in paperwork. Unfortunately, not everything always goes as planned. In fact, it rarely does. Many of the professional florists constantly are adjusting and changing plans, when different problems arrive. Whether it is bad product arriving, flower shortage, weather, delivery/time changes, we are always on our toes. Maybe the roses we ordered aren’t as big of heads as we’d like or a crop comes in a mess, we improvise and adjust almost every week due to the changing product we work with. Sometimes it means spending a little more than we budgeted on our end to ensure our product meets our high standards. We’ve learned to be flexible when something unplanned that comes up.